What is the page on your website that captures most leads? If your answer is “the homepage”, then in all probability you either do not utilize landing pages or they don’t work as they should. The first assumption is highly unlikely, as according to MarketingSherpa research, 64% of marketers believe landing pages to be the most effective way to deliver a valuable offer to their clients. So, let’s focus on the second variant - namely, that your present landing page conversion rate is much lower than desired. In other words, the percentage of people who perform the action you intend and gently direct them to via your landing page is too small. It is a pity, since if you bother to create a landing page, or lots of them, instead of being happy with directing all your traffic to the homepage, then getting poor results is frustrating. 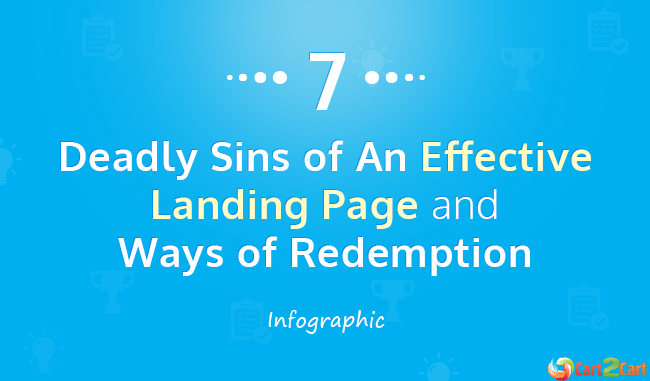 Luckily, you can change your landing page indefinitely till it serves its purpose completely. But how do you know where to start and what has to be changed in the first place? The recent Quicksprout infographic comes to the rescue, suggesting the most frequent landing page flaws that hinder your conversion graph in climbing high up, and shows how to turn them into advantages. Help yourself! So, how many “points” did your landing page(s) score out of 7? You must be anxious to start fixing them right now. After detecting the possible drawbacks, the key to success would be to think of their alternatives and then keep testing the new variants to find the most effective one. It would be wise to change one thing at the time in the new page versions, so that you know for sure what brought you the conversion boost. We would be happy to get your feedback on what flaws were the most critical to the success of your landing pages and how you fixed them. You’re welcome to share your thoughts in the comments below - so, join in the discussion.